The Debt Snowball Method is a great way to pay off debt and reach the ultimate prize of debt-freedom. But is there ever a reason to pause or delay your debt snowball and push back your debt-free date? No matter how motivated or driven you are to become debt-free, there may be a time that you need to pause your debt snowball. Pausing your debt snowball should not happen to many people. It should not be a frequent occurrence or a long pause. The main reason that the debt snowball works is because you gain momentum and confidence with each debt that you cross off your list. You get more and more motivated to pay off the next debt. If you push pause, you lose most (if not all) of that momentum. Pausing the debt snowball should be avoided at all costs, but sometimes it’s necessary. The Debt Snowball Method is a strategy to help you prioritize and pay off your debt quickly. Using this method, you pay minimum payments on all your debts except for the one with the lowest balance. All of your extra money goes towards paying off the debt with the lowest balance. Once your lowest balance debt is paid off, you move onto your debt with the next lowest balance. You continue to pay minimum payments on all debts but put all of your extra money towards the next lowest balance debt. You snowball your payments until all your debt is paid off. It takes something very important to disrupt the momentum of your debt snowball rolling. Here are five situations where it is okay to pause your debt snowball. But don’t forget, you need to restart it ASAP and get the snowball rolling again. We all need food, shelter (with electricity/heating/cooling), and clothing to survive. At a bare minimum. If you can’t afford these basic necessities for yourself and your family, you need to push the brakes on paying off debt. Focus on what your family needs to survive. Once you have that covered, you can return your attention to your debt payoff. You can’t neglect your (or your family’s) basic needs. You don’t always have control over your job and your paycheck. If you’ve lost your job, then you need to pause your debt snowball. This is an emergency, and it’s time to live off of your emergency fund. Your savings needs to go towards your basic needs, not towards debt. The debt payoff can wait, but not for long. Create a new bare-bones budget to minimize your expenses. Start the search for a new job immediately. Find side-hustles (dog walking, babysitting, etc.) that can put money in your pocket as soon as possible. Your health always comes first. There is nothing more valuable than it. If you need money for doctor visits, hospital stays, or surgeries, then you need to pause your debt snowball and funnel your money towards getting better. Once you have recovered, restart your debt snowball with your renewed power. * Note: If you are pregnant, you may also choose to delay your debt snowball. There are a lot of unknowns when having a baby. If pausing your debt snowball to save up a bunch of cash makes you more comfortable or reduces your stress, then do it. Just be careful and make sure that you are still living frugally and saving your “debt snowball money”. Don’t spend that money on cute onesies or a Pinterest-perfect nursery. Restart your debt snowball as soon after birth as you can. You now have one very cute reason to get out of debt and start living the debt-free life. Life happens. Emergencies happen. Emergencies that cost more than your emergency fund are reason to pause your debt snowball. It could be a medical emergency like mentioned above, an environmental emergency (flood, fire, etc. ), or a basic need emergency (your A/C unit breaks). Pause your debt snowball, try to cash flow the money required to fix the situation, recover from the emergency, and then dive back into your debt snowball as quickly as you can. The less of a break you take, the better. We are entering dangerous territory here. Warning! This ‘reason’ could derail your debt-free journey and should be used very, very carefully (and sparingly, or not used at all). I don’t think money is the most important thing to anybody reading this. There are things that matter more – specifically family. There are a few things in life that you can’t delay. They need to be done right away….whether you are in debt or not. One example that comes to mind is if you have a sick or dying relative. I truly believe that visiting that relative (even if it’s going to cost you a plane ticket) is more important than an extra debt payment. That’s my opinion. Do you have something that would cause you to push pause on your debt snowball? I highly suggest you make a list right now (a short list, wink-wink). This way, if that situation comes up, you have already given yourself permission to pause the debt snowball. If a situation comes up that is not on your list (a fun trip, a high school reunion, a wedding), then you know that you can’t pause your debt snowball. The situation is not worth delaying the glorious debt-free feeling. The reason that you pause your debt snowball is to avoid getting into more debt. You use the extra payments that were going to your lowest balance debt and you apply it to your emergency or special situation. If you aren’t experiencing a situation that requires money immediately (like Reason #2 losing your job), then put all of your extra debt payments into a savings account until the situation is resolved (you get a new job). That extra money might be needed for your basic necessities. If it isn’t (you hopefully get a new job quickly), then you can make a lump sum payment to your lowest balance debt. Notice how I kept using the words ‘pause’ and ‘delay’. I never used the word ‘stop’. That’s because there is never a reason to stop your debt snowball. 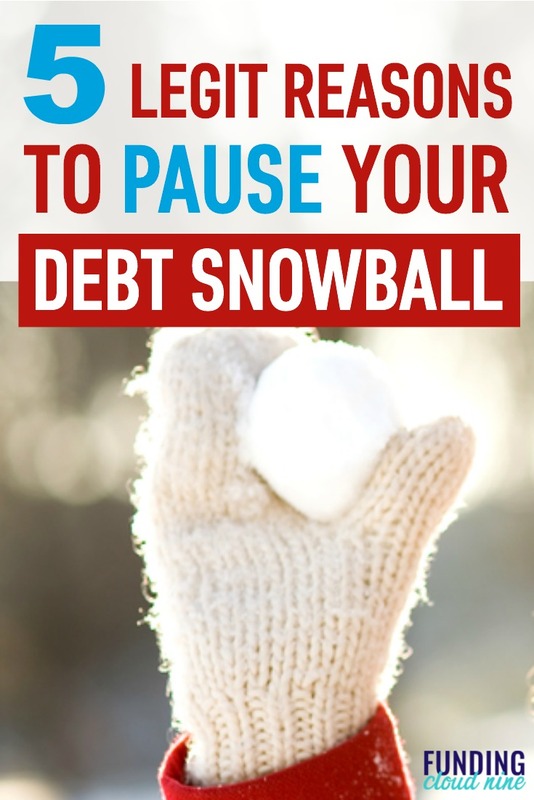 You can temporarily pause your snowball, but you should never stop aggressively paying off debt. Stopping is giving up. It’s saying that you don’t deserve to be debt-free. And that’s not true! You deserve to be debt-free…you just have to sacrifice a little to get there. If you use any of these reasons to delay your debt snowball, you should keep the break as short as possible. It’s very easy to say, ‘oh, I’ll start again next month’ and just keep delaying. The shorter the break the better. Have you ever had to pause your debt snowball? If so, why?